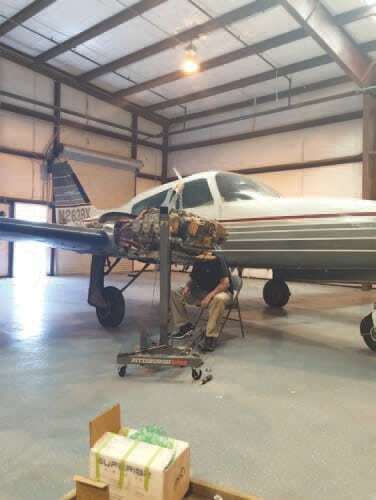 Away from Home | Tennessee Aircraft Services, Inc.
Often, I make light of an airplane’s propensity to choose some of the most inopportune moments and locations for breakdowns. I have only anecdotal evidence that this phenomenon exist, but sometimes personal experience solidifies my belief. When my shop is hired to recover a damaged plane, it’s usually a common straight forward event. These recoveries can vary in complexity from expired annual inspection to wings ripped off by a snow bank. When a plane is deemed flyable, the most extensive repair work might consist of installing a propeller and performing some simple temporary sheet metal patch. Whatever the flight preparation, repair time rarely exceeds an eight hour day for two experienced mechanics. There might be as much as a day of travel on each side of the field day. Recovery of a non­flyable plane still has the same travel time. Interestingly, disassembly and loading on our trailer only takes an 8 to 10 hour day for a couple of experienced mechanics. The difference between flying recovery and trucked recovery is in the cost of putting the plane back together later. Every now and then, I get the opportunity to do a recovery that’s a little more challenging and out of the routine. The most recent out of my routine recovery was with a good friend and definitely more than a day’s drive from home and a day’s work to get the plane ready to fly. The planning and logistics involved turned out to be a significant challenge. Recently Mike Busch had a “little” problem with the right engine of his T310R that helped confirm my hypothesis about airplane failures away from home. On his flight to AirVenture 2014, the #6 piston separated at the oil ring groove sending large aluminum chunks throughout the engine. The event occurred just North of Las Vegas, so the engine was shut down, and the plane safely landed at KVGT. The pilot did an excellent job of securing the engine, communicating with ATC, following proper protocol and making a wonderful landing. However, in all the excitement he forgot to forget to extend the landing gear which would have totaled the aircraft and eliminated the need for any further investment in its repair or recovery ­ I jest of course. North Las Vegas is a nice enough place but a definite problem when it isn’t your home base where you usually perform your own maintenance. This recovery is definitely not my usual, but if recovering Mike’s 310 was a normal recovery, I wouldn’t be telling you about it. We were installing the engine in a rented aircraft storage hangar with no shop equipment supplied. 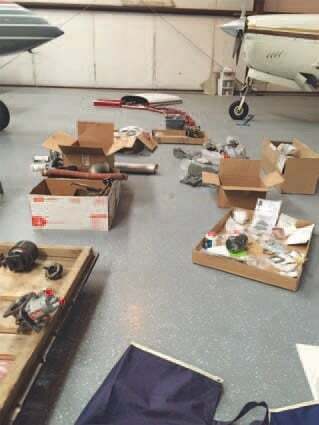 Mike’s engine was removed from the plane by a local shop at North Las Vegas, but for various reasons, they would not be the reinstalling facility. The shop used normal methods one might use if they were also going to be reinstalling the engine after repair. No matter how fastidious one is in removing and documenting their work, it’s still difficult for someone else to follow after that. A simple example is how people label things differently. Consider the possibilities for left and right: lf, rt, lt, port, starboard, pt, st, and so on. You’d think everyone would use the same nomenclature for all the airplane parts, but it isn’t so. Engine just being set onto the mounts. The engine lift had to be purchased and assembled first though. We donated it to a local flight instructor after all was completed. There were lots and lots of small hardware stored in small cotton string pull bags with no labels at all, some attached to their related part of the plane. Much of the hardware wasn’t reusable due to rust or just normal wear. None of this is an issue if the engine is installed at a shop with a wonderful hardware inventory readily available. We thought to bring some new replacement hardware but definitely not nearly everything we needed. When on the road, one discovers just how difficult it is to find aircraft hardware. Replacing an old flexible fuel or oil line is a very simple procedure when removal and installation are performed as one event by one person. During removal the old routing is noted so the new hose can be installed in similar fashion. When replacing an engine, all the hoses get removed at one time, then installed at a much later time. Digital cameras are an amazing tool to document hose and wire routing prior to engine removal. We didn’t have access to any photo documentation made by the removing shop, so we had to figure out routing as we worked along. You may be thinking the left engine would be a perfect reference. Unfortunately, the left engine of the T310R is not the same as the right, nor is it a mirror image so not much help there. Sometimes it can feel a bit like putting together a jigsaw puzzle using only a mental image of the engine last seen months before. Parts is Parts. Most of the needed parts and accessories laid out and ready to install. Engine cooling baffle is another source of uncertainty. The metal baffle with the silicone material is simple enough to install and pretty much only installs one way. It’s the many years of tweaking with RTV and feed through grommets that creates the grief. So many details that you’re sure will only take twenty minutes end up involving hours trying to get it right. Another major difference in this recovery is the amount of time the aircraft sat dormant. While investigating the cause of the failure and planning repair possibilities, unexpected life events occurred that put any airplane activity on the back burner. Compounding the problems of a long down time was the fact that it was in North Las Vegas. When this Tennessee boy thinks about Las Vegas, low humidity and the gambling come to mind. What I didn’t consider was extreme heat and sand blowing around. It’s true the dry climate is good for longevity of aluminum, but the heat and sand play havoc on everything else. We were very fortunate that our local North Las Vegas friend found and secured an “air conditioned” hangar for us to work in. The Las Vegas definition of an “air conditioned” hangar is that it has a built-­in swamp cooler. The lowest high temperature during our stay was 109 degrees, so it was all the swamp coolers could do to lower temps in the hangar to the upper 80s in the morning and into the lower 90s by late afternoon. “They” say it’s no problem because it’s dry heat, but I can tell you 109+ is just hot no matter what the humidity. Our planning and initial recovery work was intently focused on the engine installation. As the engine installation was coming to completion, we relaxed enough to start noticing the condition of the rest of the plane. More issues presented themselves as we prepared for the first run of the newly installed right engine. Just a quick list of discrepancies: nose strut flat, right brake inop, left brake very soft, right main tank electric transfer pump whines but doesn’t pump, control yoke very stiff to the point of scary, GPS battery dead and the headset battery holder dramatically disfigured due to months in the greenhouse heat of the cabin. None of these existed when the plane last flew, but many months of Nevada weather will do strange and mysterious things to airplanes. All simple items except that it’s Saturday morning in North Las Vegas with none of the simple tools needed for these repairs were readily available. Setting the nose strut pressure is a very simple operation of lifting the nose gear off the ground and pressuring the strut to 48 p.s.i. No problem, right? Just lifting the nose of the plane to extend the strut can be an issue with no jacks. The tail can be pushed down to extend the nose strut, but it takes more than the two people we had available for this simple operation. Oh, and where will we get 48 p.s.i. of air with no air compressor? That’s just one more trip into town for a portable air bottle. Bleeding a brake is about a ten minute job unless you don’t have a way to pressure fluid from the caliper to the master cylinder. Another trip to town is in order. By the way, in my small world, I imagined MIL­H­5606 hydraulic fluid was exclusive to aircraft. As it turns out, it’s used in all sorts of industries including boating. I’m just saying in case you get stranded some day. There is a transfer pump in each main fuel tank which keeps fuel at the tank outlet port during steep descents, and they are wired to run all the time. When on the ground these pumps can be heard making a continuous “ticking” sound, unless they’ve been sitting in the desert for many months. After a few minutes of a whining noise and a couple of thumps on the tank, it came back to life. No need to attack this one with tools just yet. Pulling back on the control yoke to check elevator movement proved to be a monumental effort. First thoughts were of some massive bird’s nest hidden deep in the bowels of the plane. As it turned out, repeated cleaning and lubricating of the pilot’s yoke eventually returned it to proper operation. 1) ­ always do maintenance at home base. If you must do maintenance away from home, choose someplace with really wonderful cool weather. 2) ­ when working away from home, have your entire shop’s complement of tools, supplies and parts shipped out with you. 3) ­ drink lots of water. 4) ­ find an air conditioned hangar to work in. 5) ­ if you can choose where this epic event will take place, pick someplace with great friends that let you live in their house for a week or two (we did). 6) ­ don’t let the plane sit for months while planning the repair and recovery. 7) ­ inspect the condition of the entire airplane early on in the project to help avoid last minute MacGyver like workarounds. Las Vegas, I strongly recommend Lola’s ( a Louisiana Kitchen). 9) ­ pack plenty of Band­Aids. Better yet, take a fully stocked first aid kit. 10) ­ however long you think this job will take, triple it. One of many benefits to such a trip is getting to know your friends on a whole new level. All the adversities create a bond that last a long time. It’s a bit like the Chevy Chase vacation movies, only it’s all good. Then there’s the amazing value of having lots of fun stories to tell to whomever you can pin down long enough to tell them.